I was biking around the Cheviot Hills neighborhood of West L.A. and happened upon this sign in front of one of the perfectly manicured lawns of the perfect suburban home in the perfect neighborhood. Everyone is happy driving their cars from their garage to pick up the kids at soccer practice or commute to work or whatever. But God forbid the Expo light rail line invades the neighborhood and takes space away from the automobile! 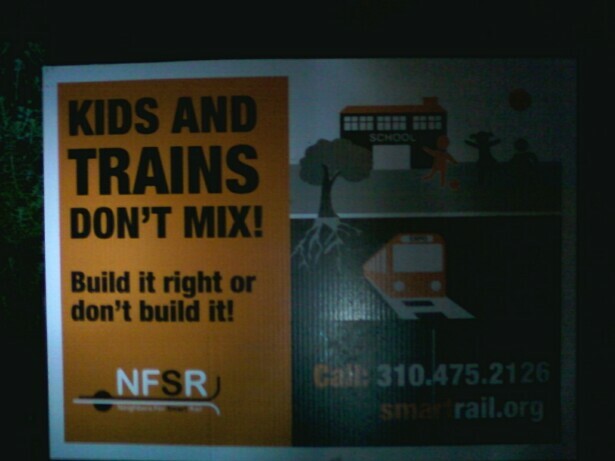 This sign is fear-mongering at its worst -- when all else fails exploit the children with a sign that states "Kids and Trains Don't Mix!" Really? Then do kids and cars mix because all I see in Cheviot Hills are speeding cars screeching around every turn. That is just wonderful for children. The Neighbors for Smart Rail organization is NIMBYsm at its absolute worst. The website states that they are against at-grade street level crossings because it will disrupt traffic, bring crime, bring more buses to the area and other factors that simply have no basis in actual reality. They want to either force at-grade crossings underground for Phase 2 of the Expo Line project from Culver City to Santa Monica or scrap it completely in favor of just the Subway to the Sea along Wilshire. Let's cut to the chase and say what they really mean. Disrupt traffic means an extra 5 minutes in their luxury cars because they would never consider actually riding the Expo Line. Crime and more buses means that they don't want those poor immigrant Eastsiders in their wealthy white neighborhood. Well guess what? Cheviot Hills residents want those Eastsiders to landscape their lawns, clean their homes, push their strollers and cook their food so why not make it easier for them to actually get to the Westside by building the Expo Line and providing more buses? And once the Expo Line is built out all the way to Santa Monica maybe some of these Cheviot Hills and Rancho Park residents will learn to love riding the rails to downtown, USC, Culver City and Santa Monica and see the Expo Line as more of a blessing than a curse.